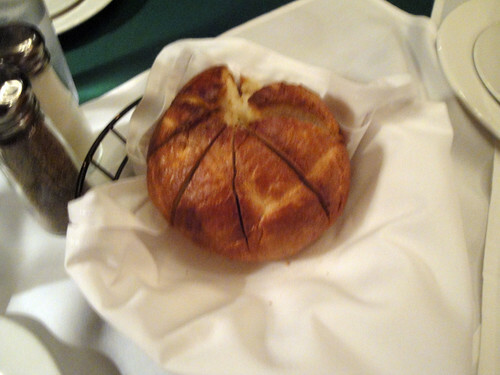 TRM: The best thing about the bread was that it was still warm when it arrived at our table. The insides were soft and delicate, while the outside was pleasantly chewy and crusty - it would make a fine bread bowl or trencher. TD: Agreed. 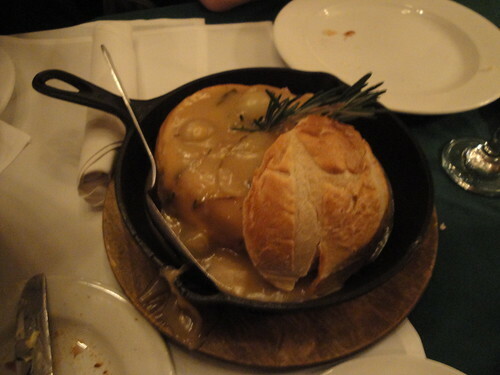 The bread started off the whole evening with a rustic, and decidedly medieval feel. Something you don't often get in Central Square. TRM: This was a lovely and shockingly filling salad. Chelsea mentioned that while she and Sariann tried to avoid naming recipes for characters, preferring to create food actually named in the books, but that this persnickety and delicate salad just fit Sansa too well. The cookbook does list a medieval recipe upon which it's based, so we're not too far out in left field, here. 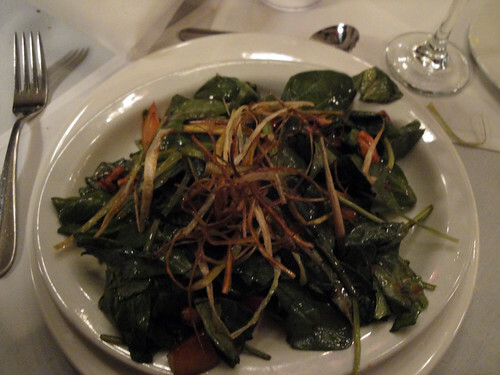 TD: Yes, despite the dainty naming convention of this salad, it was quite filling. While I believe the book version calls for prunes rather than plums, the chefs were able to take advantage of plums being in season. If you wanted to add the edible flowers as also mentioned in the book recipe, nasturtiums are a lovely choice. TRM: In full disclosure, I was not expecting to like this soup very much. I'm generally not a huge fan of cream soups or things with seafood flavors - I love actual fish, but I like it fairly straight up. So imagine my surprise when this was one of my favorite parts of the whole meal. The soup was creamy without being overly thick the way some chowders can be, and the fish melded into the stew beautifully. I will definitely be making this at home this winter. 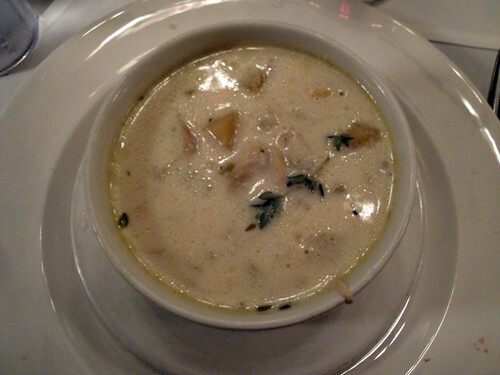 TD: Typically, I don't eat cream based soups. It's more of a digestive thing...but for this I came prepared and was ready to eat. What I also liked about this soup was that it wasn't heavy like a chowder or bisque, instead the flavor of the fish, and other ingredients were very present (rather than the flour and butter base of some chowders). TRM: Oh look, there's the crusty white bread, being used as a trencher! It did the job as admirably as expected. Side TRM story - my family makes boiled onions for Thanksgiving, as many families do. However, instead of teensy-tiny pearl onions, we boil whole Spanish onions in milk and butter and eat them alongside our turkey. This is one of my favorite parts of our meal, and I think faintly horrifies outsiders. Anyhow, this was like that, except tinier and slathered in tasty gravy. What's not to love? TD: I think this might have been my favorite dish. Probably because of the high gravy ratio. I love gravy, in fact, I have even uttered the controversial statement "I love gravy more than bacon". The beef based gravy was slightly sweet, as were the small pearl onions, giving this dish a lovely sweet and savory balance. I know I could have made a meal of it...and some of that bread bowl. 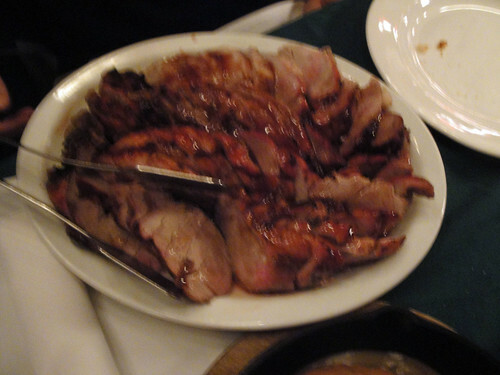 TRM: This was easily the most perfectly cooked pork I have ever eaten - completely tender and juicy. The sauce complemented it perfectly - I think we can all agree that pork tenderloin, boar or otherwise, is not the most exciting meat solo. I tried not to think about poor King Robert while I enjoyed this dish. TD: This was the first time I have ever had wild boar as a tenderloin, and despite the name, it was super exciting *rimshot*. The boar itself was incredibly tender and rather than tasting gamey, it was a deliciously amplified pork. And the sauce...oh the sauce...it was like Christmas liquefied for my drizzling pleasure, slightly tart from the wine, with warming spice of cloves. 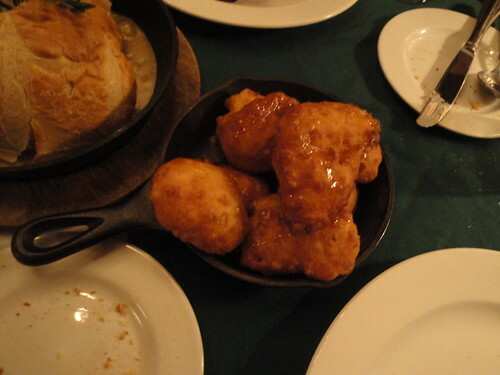 TRM: Corn fritters are one of those dream foods for me - they're like a doughnut, except instead of being cloyingly sweet, they are tasty and slightly savory. These were cooked perfectly and served in a tiny adorable cast iron pan. Anyone who knows me knows that I love tiny things. 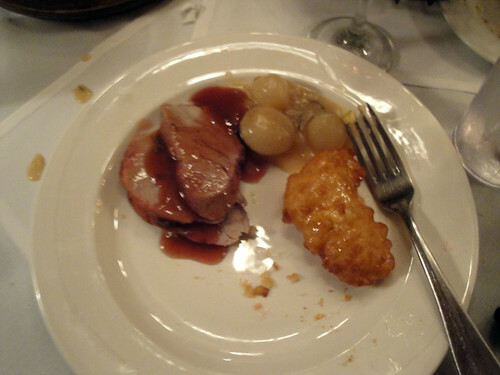 TD: There was a serious tug-o-war between these fritter and the onions and gravy for "favorite". It's fried corn! The kernels and corn meal make these fritters both chewy and crisp...and amazing. I am planning on making these myself. TD: I was also super stuffed by the time we got to this point. So while I did taste the cake the night of the dinner, I enjoyed it more the next day. 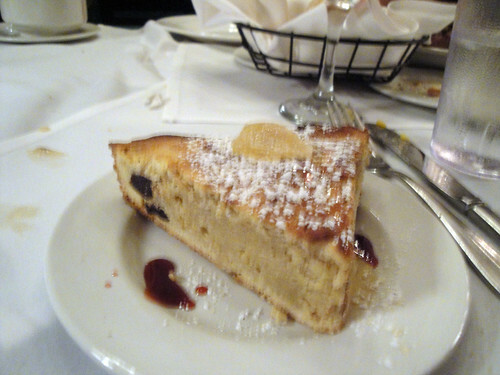 The cake was dense but moist and was ginger spiced with dried cherries. While I am not usually a huge fan of pine nuts, I didn't mind them in this cake. And yes, I am one of those people who actually likes fruitcake. As you can tell we quite enjoyed this meal. The Goog even said it was one of the better meals of his life. It has also been very inspirational to try more of the recipes at home. The honeyed chicken from the book/blog has already made it into the dinner rotation, and the corn fritters are likely to do the same. TRM: I definitely loved this - there were a few other great touches, including banners for various houses set up over the booths (we were at the Lannister table - quelle horreur!). I really appreciated the chance to chat with the ladies and hear what other projects they're planning, as well. Like TD I'm hoping to really use the cookbook this winter (many of the recipes are hearty, cold weather fare) - and possibly hosting a grand feast of my own! 3 Series I Am Currently Reading, Are You?